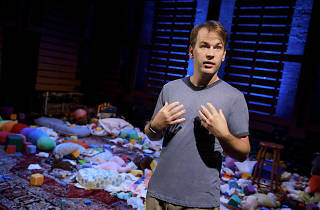 Mike Birbiglia may not be thankful for his eventful medical history—a bladder tumor as a teen! an injury by a drunk driver! a life-threatening sleepwalking disorder!—but his fans certainly are. He's a master at turning his travails into dark comedies that are as unflinchingly honest as they are entertaining. Although he honed his punch-line skills on the comedy circuit, his solo performances aren't just glorified stand-up. Since making his Off Broadway debut ten years ago with Sleepwalk with Me, which he later transformed into a best-selling book and an indie film, he's proved to be a gifted theatrical raconteur who weighs the impact and delivery of every word to uproarious effect. 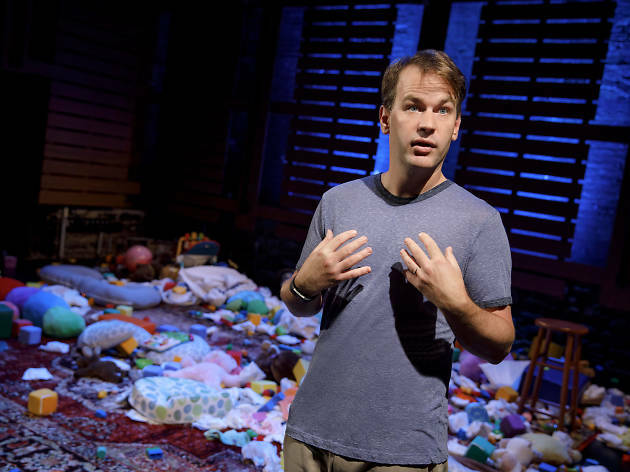 Thanks to his fervent following and the small size of the Cherry Lane Theatre, Birbiglia was able to sell out his latest show in advance, without even revealing its theme. But I'll clue you in: The New One is about his reluctant (and, of course, medically arduous) journey to fatherhood and how it has changed his life. That may sound about as scintillating as potato salad, but Birbiglia isn't some generic straight white guy whining about domesticity. He is raw, self-deprecating and painfully aware of both his privilege and his failings. When he admits to thoughts about romance and parenting that are verboten but common, you can't judge him without condemning and laughing at yourself. Birbiglia's longtime director, Seth Barrish, pulls off a stupendous sight gag and maintains a flexible pace that allows the star to ad lib and slow down when necessary, though a joke is never far off. The show isn't groundbreaking in structure, style or substance: No, no, it's not Nanette. But the meticulous and evocative way he expresses himself makes The New One—like a newborn baby—special, unique and lovable. Cherry Lane Theatre (Off Broadway). By Mike Birbiglia. Directed by Seth Barrish. With Birbiglia. Running time: 1hr 20mins. No intermission.